Open and edit PDF files in your application or service with just 2 API calls. Generate PDF from file, data or "scratch". Stamp and watermark. Merge/Split. Access PDF object data and manipulate. Extract or delete objects. Map native file format. Command-line interface. 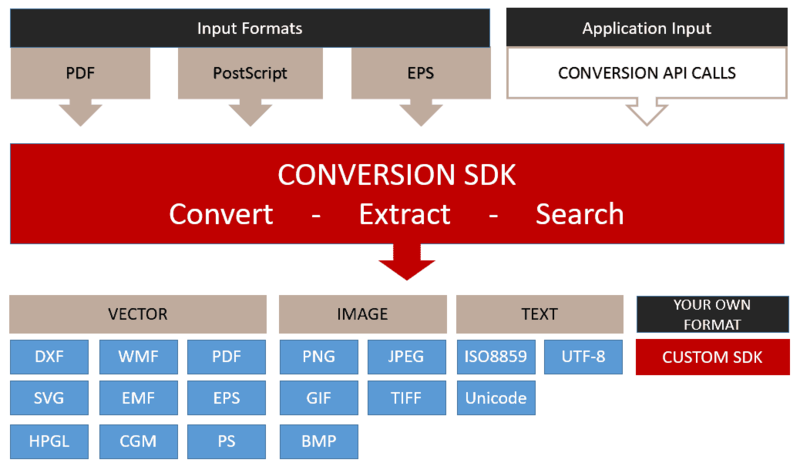 Automate PDF conversion to vector or image formats. Extract text. PDF API's with hooks and examples for ODA. 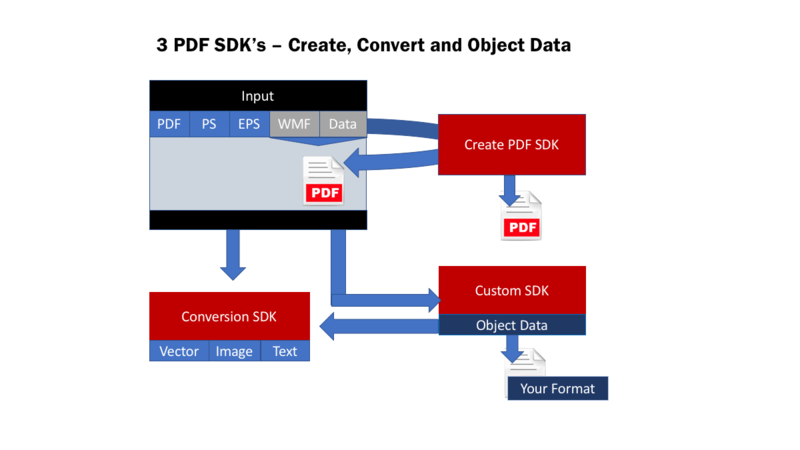 If you're looking to add PDF import to your application, generate editable vector graphics and bitmap images, or, you're trying to automate a high-volume PDF or PostScript conversion workflow, you've arrived at the right place. For more than 25 years, PDF and vector graphics are all we've been doing and you won't find lean, powerful, high-performance tools like ours anywhere else. Trust that all levels of PDF are supported from 1.X to the latest ISO specification for PDF 2.0, as are creation and remediation of PDF/UA pages. As our support for PDF/UA evolves, please contact us with any questions or enhancement suggestions. Visual Integrity has developed a robust conversion framework proven in the field and battle-tested by the most demanding customers over the past 20+ years. All of this real life experience has resulted in a flexible, optimized conversion engine which can drive process automation as well as extend functionality in enterprise or commercial applications. The same engine is found at the core of everything we produce, both development tools and end-user products. Developer products are offered in two classes - command-line conversion servers and API/DLL libraries. We offer free evaluations of both. What's possible with the developer tools? Import/Export - With just two calls, you can add import/export functionality to your application and give your users control over orientation, scale, resolution, and more. Edit PDF - In just a few minutes, your application can digest vector PDF or PostScript files and present them in your native format ready for editing at the object and text level. Server Automation - Using one of the command-line tools, you can automate conversion for anything from a departmental workflow to a high-volume enterprise process. Text Extraction - Effortlessly pull ASCII text from your files with an option to retain character placement, create an abstract or strip text only. Web Images - Pump PDF and EPS through the engine to generate high-fidelity web graphics. Standard formats supported - JPEG, GIF, PNG. Option to add SVG vector format. Fax & Archive - convert PDF or PostScript into the industry-standard archival and Fax formats, TIFF. Stamp & Merge - Add stamps and watermarks to PDF files in batch mode. It can also merge PDF files or split them into individual pages or a range of pages. Custom Development is available for customers who require enhancements or extensions. Pricing available upon consultation. OEM Licensing is ideal for companies who want to integrate the PostScript or PDF conversion engine into their software, hardware or mobile devices. Our engine is unique because it does not require any Adobe software or printer drivers to operate. What this means for you is high-performance. The code is lean yet offers abundant options for you to customize the output to meet even the most demanding specifications. None of our developer tools require either Adobe Acrobat or GhostScript. All of our products are standalone tools, completely self-contained, and based on our powerful engine developed, improved and extended over more than two decades. Our products are not based on print drivers as brokers so the conversions are faster and always accurate. Everything that you need to run them on your desktop or to use them for your development is included in your delivery download. Configuration & Just Two API Calls.Using the SDK is simple. Included in the SDK are header and lib files for the conversion libraries, font directory, batch programs, documentation, sample source code projects for Visual C++, C# and Basic (Other interfaces available upon request). Input formats supported on the command line are PDF and PostScript. The Conversion Server is capable of producing vector formats, bitmap images and text from the input formats. Examples are PDF, WMF, SVG, PNG, TIFF and Unicode text. A common trap for conversions is a font mismatch. Due to licensing issues, fonts can not be embedded in documents. They can be mapped or substituted. Take care in this area to ensure perfect results. A sample .ini file is provided with the command-line tool. It can be used as a base to understand the many options and to tailor them to your needs.